There are some great teams of players here at Pro Tour Oath of the Gatewatch. Many of the names may be familiar—Ultra PRO, The Pantheon, ChannelFireball, Face to Face, DEX Army—and many of the players as well, but sometimes we could use a little more. Mike Rosenberg wrote a great primer on the Pro Tour teams and each member already, but here's a deeper dive into just a few of the teams that are looking to make waves this weekend. 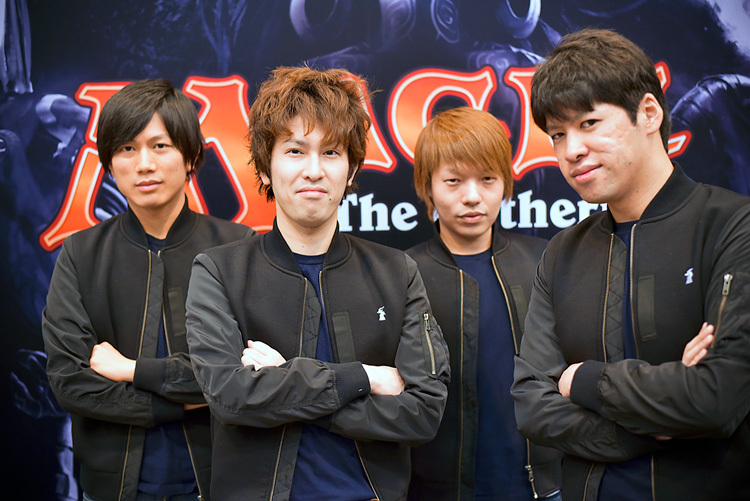 One of the newest sensations in the world of Magic is the small Japanese team, Cygames. Like teams in the eSports community, the digital and social game company Cygames has strongly sponsored four Japanese players who are all top-tier, and threaten to make Top 8 each weekend: Two-time Player of the Year (13) Yuuya Watanabe, Yuuki Ichikawa, Kentaro Yamamoto, and Teruya Kakumae. Cygames offered the four players something different that they weren't used to. "Testing was very different," he said. "We had a 'boot camp.' They brought us to the Cygames offices for three days, put us all up in hotels, and we drafted constantly. Though we usually test at friends' houses like this, the packs are the ones we brought. Cygames providing the space and the product was a great help to us." Cygames picked these four because they are all people who are not yet Hall of Fame, but are all Hall of Fame caliber. Cygames' Executive Director, Yuito Kimura, is a huge Magic fan, and really wanted to support the game and the Magic scene in Japan. Team Cygames, and their player base, seem like a great way to do that. And perhaps on Sunday, Cygames will see their first Top 8. When I asked Ichikawa who was going to finish the highest, he said very quickly, "Yuuya Watanabe." But then he paused. "Wait, me first, then Yuuya." For more on Team Cygames, check out Chapman Sim's profile from Grand Prix Nagoya last weekend (before Watanabe was announced as part of the team for the Pro Tour). If you aren't familiar with The Pantheon, then this might be your first foray into the Pro Tour. And that's perfectly fine, but just know to take your sunlight where you can get it, because they can cast a big shadow. William Jensen, (1) Owen Turtenwald, (8) Reid Duke, Jon Finkel, Kai Budde, Gabriel Nassif, Andrew Cuneo, Jelger Wiegersma, Ben Rubin, Brock Parker, Antonino De Rosa, and back-to-back World Champion (16) Shahar Shenhar make up the list. And so you don't have to do any googling, all but two members of The Pantheon are either Platinum Pros or Pro Tour Hall of Fame members. Or both. It's pretty crazy. The team is famed for gathering the best players in the world, and with a two-week preparation period at a team house, they get done what needs getting done. Coverage guru and Pro Tour Historian Brian David-Marshall did a six-part video series inside the house, now showing throughout the weekend on the Pro Tour Oath of the Gatewatch stream, which is as insightful as it is awesome. This time around, I talked to the newest member, Antonino De Rosa, to learn just how it felt at the house. For De Rosa, it was all about how great they really were. "I couldn't have possibly expected how awesome they were," De Rosa said. "My expectations were high, but not nearly high enough." "Even the younger ones in the group—Owen, Shahar, Reid—so mature, so polite. When I was 22 on the Pro Tour, people were not nearly so nice." Because the normal house chef, winningest Magic player ever Kai Budde, arrived late, it fell on Antonio De Rosa to play Kai in the kitchen. "Look, I just didn't want to just eat sandwiches all the time," De Rosa laughed. For De Rosa, the testing was clearly amazing, but it was all about how good the team was to him. "I know I used to be good, but I'm not as good as them. They never made me feel that way at all." He talked about their personalities and demeanor so much partially because we all know how strong their testing unit really is. "Once I prequalified, I asked if I could test with them," he continued. "But I had to plan. I didn't even go home for the holidays to save my vacation days for the full two weeks of testing." It took a lot of prep, but De Rosa knew it paid off in spades. He made some newer friends, and got to share a house with the world's best players—even if he had to cook sometimes. There has been a lot of hullaballoo about Team EUreka recently, and with good reason. The newest European Union collaboration is huge in number and in stature. There is a core group—often stewarded by "Big Z" Matej Zatlkaj—that watches over the potentially unwieldy number of trans-European players. But just last week, the team showed that even without their steward, they work cohesively as a unit. At Grand Prix Mexico City, the team cleaned up the top tables, and even vaulted Fabrizio Anteri to the win. Matej Zatlkaj, Wenzel Krautmann, (HoF) Olle Råde, Pierre Dagen, (24) Martin Dang, Immanuel Gerschenson, Nikolaus Eigner, Anders Melin, Oliver Polak-Rottmann, (9) Fabrizio Anteri, (7) Martin Müller, Magnus Lantto, Aleksa Telarov, Simon Nielsen, and (20) Joel Larsson round out the team. And it can be a task to coordinate this many people in the same country, let alone across many borders. "This is the biggest we will ever be," said Zatlkaj. And as self-acknowledged "jerk" of the team, said that they could use another jerk to make sure the whole group is on task. 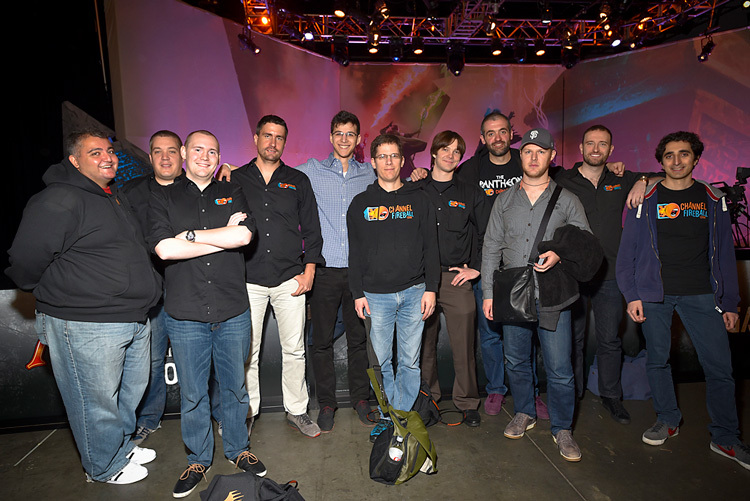 But the player list can't really be denied—multiple Pro Tour winners (in the last 12 months! 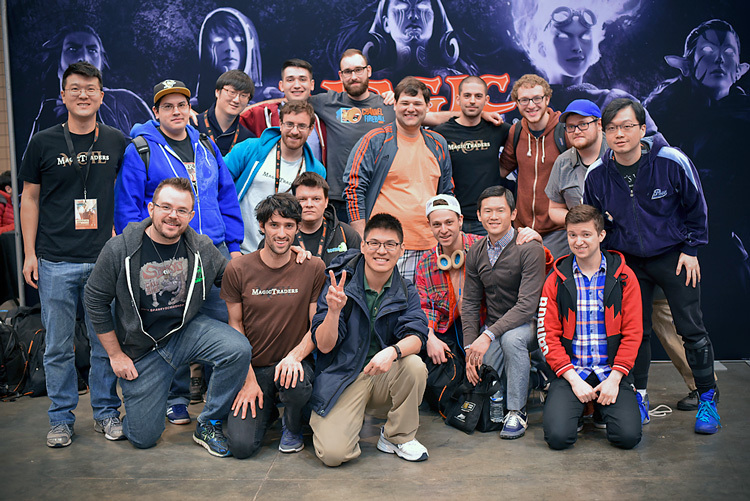 ), plenty of Gold-level pros, and a Pro Tour Hall of Fame member makes for a scary team indeed. You should have all these names in your mental rolodex. If they can come anywhere close to replicating their Mexico City dominance, you'll be hearing about at least one of these guys on Sunday. Larsson's pick was Simon Nielsen, and Zatalkaj agreed, saying, "He's the most improved player by far. In the last year, he's become an extremely strong player." You can, and should, read about their Mexico City exploits, and Brian David-Marshall's Magic Lifestyle piece about Team EUreka Moments. 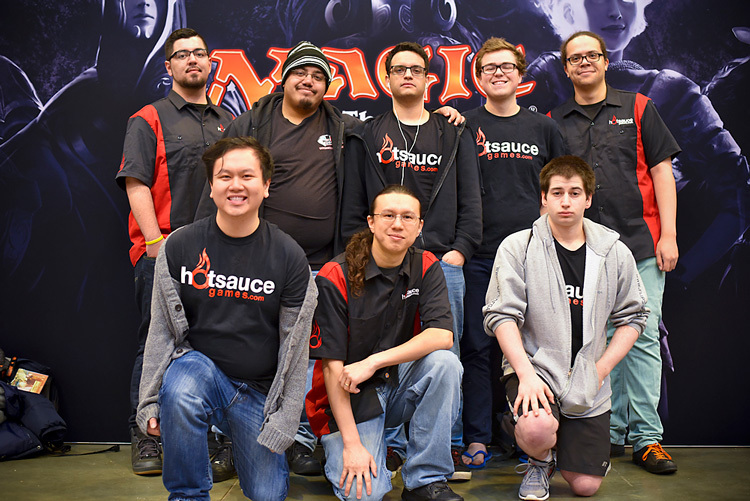 HotSauce has been around for a while, but made some splashes recently, at Pro Tour Magic Origins, and much more recently at Grand Prix Vancouver last weekend. Many people on team HotSauce are even keel, reflective of their team captain, Adam Jansen. But don't let that demeanor fool you. Jansen just took down Grand Prix Vancouver and celebrated with little more than a smirk. "Yeah, it feels good," he said. He's not only HotSauce's team captain; as former Rookie of the Year Raymond Perez, Jr. said, he's also Team Father by taking on cooking, administrating, and task-mastering. Jansen knows how to set his team straight. The roster looks like this: Adam Jansen, Raymond Perez, Jr., Ben Moir, Dan Lanthier, Christian Calcano, Thien Nguyen, Oliver Tiu, Jake Mondello, Nathan Smith, and Greg Orange. They picked up some newer marquee members like Canadian specialist Dan Lanthier, and Christian Calcano to make sure the team is all steering together, and have some good experience on the team can add a lot. One of the newest, and youngest, members is Nathaniel Smith, who is a ball of nervous energy. He paces back and forth, wildly shuffling cards to do so something with his hands. Smith said, "There's a swing in the [team] house, and I would just sit and swing viciously." He was pacing while saying this. Here, Jansen plays his perfect complement, helping him to get out the energy in a positive way. For Magic Origins, HotSauce Games was only on two decks: Abzan, and the Thopter deck that put Stephen Berrios in the Top 8. "But for that tournament, those were the right two decks to play. Modern is much more about personal preference, and so the team explored which deck felt the best for them," Jansen said, noting the lack of Modern deck choice cohesion. As for who was going to do the best, Smith said, "Well, we all kept losing to Greg [Orange's] deck." But no one else is on the deck because, as Jansen told me, "No one else can win with Greg's decks." Greg said, "Well yeah, it's unbeatable—I assume." So there you go. Making their breakout performance at Grand Prix Vancouver last weekend, threatening to put multiple members in the Top 8 going into Round 15, Team East West Bowl gets the vote on "Team You Most Likely Haven't Heard, But Just Might After This Weekend." Composed up of people from the former reformed TOGIT team and California Pro Tour regulars, the team is on the other end of The Pantheon spectrum, with few members yet above Silver—but the operative word is "yet." The team list is: Alex Majlaton, Pascal Maynard, Ben Friedman, Jarvis Yu, Mark Jacobson, Tommy Ashton, Timothy Wu, Nicolas Beland, Benjamin Weitz, Andrew Brown, Ricky Chin, Scott Lipp, Vidianto Wijaya, Adam Boyd, Paul Yeem, JC Kystich, Benjamin Nikolich, and newly Eric Severson (thanks to his Top 8 in Vancouver last weekend). Alex Majlaton said that the team was originally formed for Limited testing only. "We wanted as much Limited data and experience possible," Majlaton, or "AMaj" said. "Once it came together as an official team, we ended up doing some Constructed testing too." As the team was working so well, the testing expanded. "Most of it was done in our discreet groups, but we came together to test online and talk about match-ups." The more players I talked to, the more they discussed the strength of the unit. Even the usually teamless Pascal Maynard said it was way better than he expected working with a team would be. Maynard usually lone-wolfs it, but was drawn by the Limited information. "It worked for exactly what I wanted it for." And having Maynard around surely helped everyone else's Limited games too. But East West Bowl is still new. "I really like everyone on the team, and loved Limited testing. But for the future, it's probably too big to also do non-Modern constructed testing. For Standard, it might be better for a more streamlined list." "I learned better what to do for next time," Majlaton said, which is the best thing to hear from such a young team. Even if this weekend doesn't pan out, I don't think they'll be going anywhere anytime soon. Lastly, there's an overarching "super-secret mega-team" that overrode all the other teams. It's an exclusive club, in which on the best Affinity players in the world are invited. Though the names are withheld, some could make some guesses as to members. It was all authorized by the members' usual teams, as this team only talked over the Internet, and strictly about Affinity. The founder said of the idea, "With Standard, the team starts from scratch and builds the decks together … [but with] a format as old and diverse as Modern, if you're locked on a deck, you could use someone else playing the same deck." He said, "Your team might not help your personal testing so much." The group is called 'Affinity Aficionados, "because that sounded nice," and they just synchronized their thought processes and wound up on similar Affinity lists. They are not playing the same 75 cards, but very close. "We have the same general philosophy, and agreed on 'this many two-drops, this many interactive spells' but people have their preferences. The first 58 cards are probably the same." 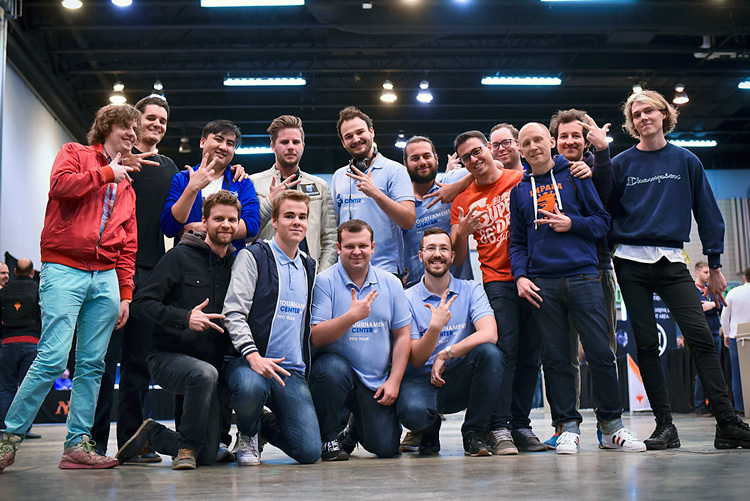 Though this will likely never happen for anything other than a Modern Pro Tour, the team worked well together and its teammates were excited at the prospect of preparing like this again next time this format rolls around. It was a transcontinental melding of minds—the true definition of a team. We've only scratched the surface on the teams here, but only time will tell which preparation, player combination, and drive will pay off the most this weekend here at Pro Tour Oath of the Gatewatch. Will the most reputable teams' work ethic and track record take them to the top, or will the tenacity of some of the young bucks make a name for themselves and their team? I can't wait to find out.